Want to train with Air Candy? Keeva is an Internationally sought out coach for Aerial and Flexibility Training. With over 100 International workshops under her belt, as well as her own studio in Berlin she is more than experienced in teaching from beginners to advanced students. Keeva is available to travel for guest workshops at other studios or you can visit her in her home Studio in Berlin Mitte. Learn with Air Candy how to get the most out your flexibility & reach your individual goals. Two incredible workshops packed with tips and tricks about how to warm up and prepare the body for extreme flexibility like over splits, needle scales, scorpions, chest stands and more! Sharing her most beautiful tricks, wraps and drops Air Candy offers workshops for both Aerial Hoop & Silk. Strongly focused on aesthetic and making the movements graceful and beautiful, you can learn the Air Candy signature moves. Right in the centre of Berlin is 200sq meters of Aerial luxury with over 13 hanging points! 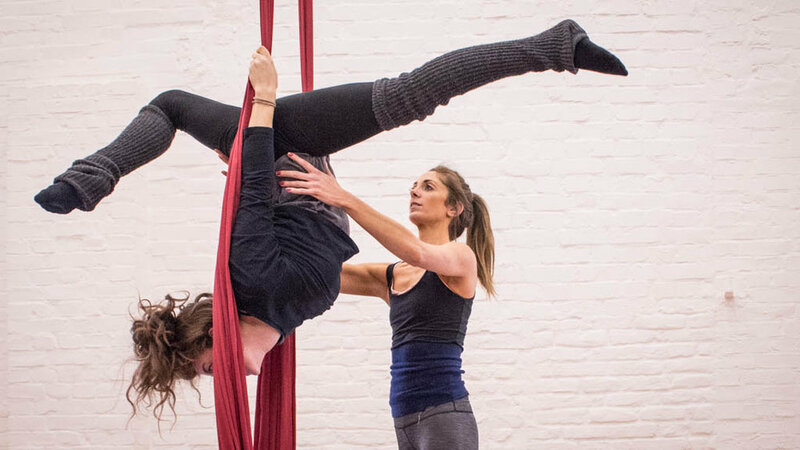 Founded by Keeva in 2017, Fl'air Studios is a not only the Air Candy rehearsal & creation space but it also offers daily classes for adults from beginners to advanced level aerial for fun & fitness. Now you can take classes every week with Keeva and the team of incredible aerial coaches at Fl'air.